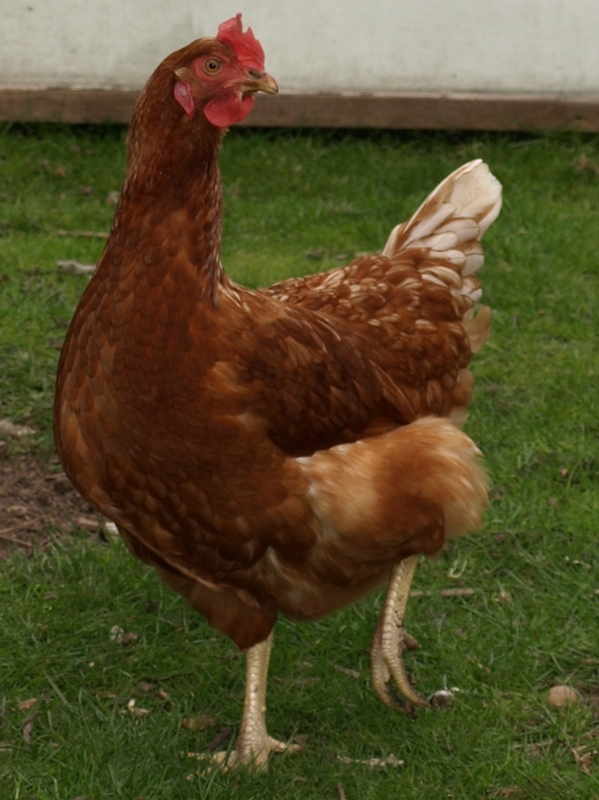 Aside from the Chickens (below), we have a Dog called Bob. Both cats, Ozzie and Dibz, are no longer with us. 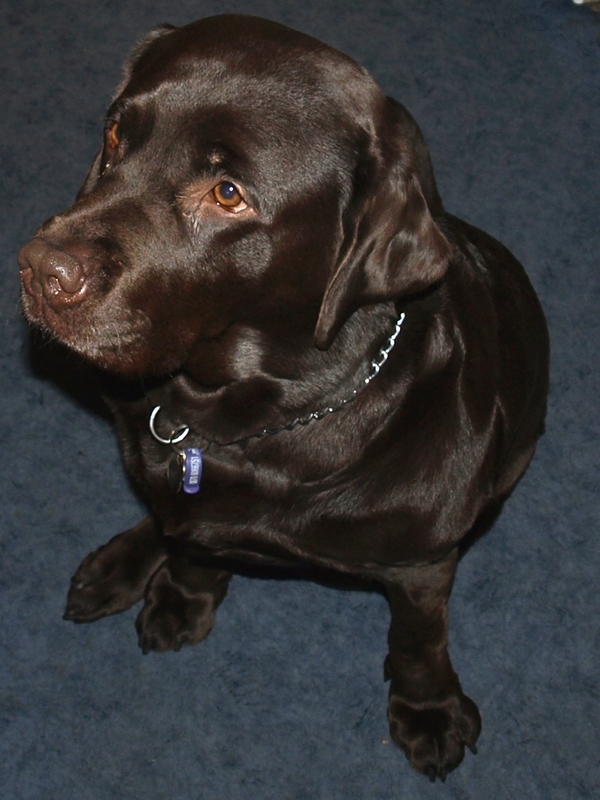 Bob is a chocolate Labrador retriever. He goes by many aliases: Bob, Bob-Dog, Bobstickle, Dogstickle, Dogbert and Bobski to name but a few. Picture taken 16 April 2010 12:43:32. Ozzie is a black cat. He, unlike Bob, doesn’t have any aliases. Pictures taken 22 July 2005 14:11:08. 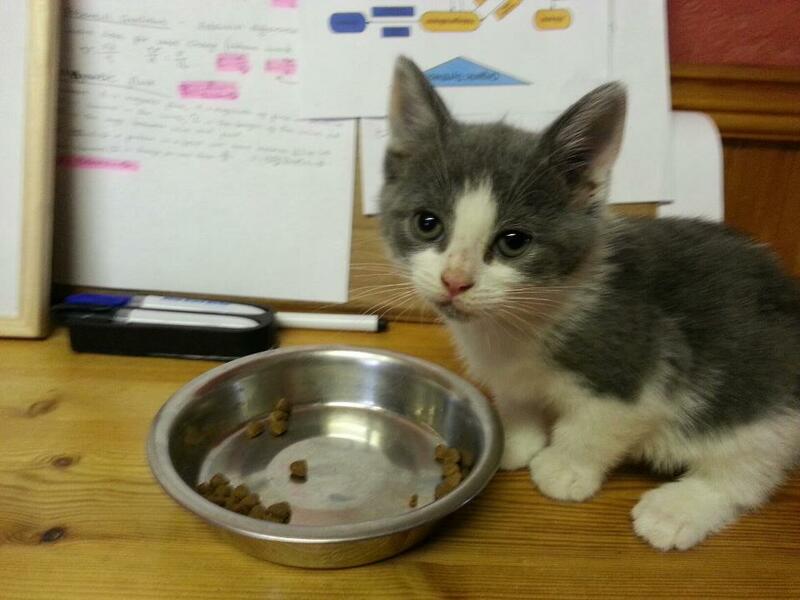 Dib-dab, or Dibz, is the newest addition to our family. 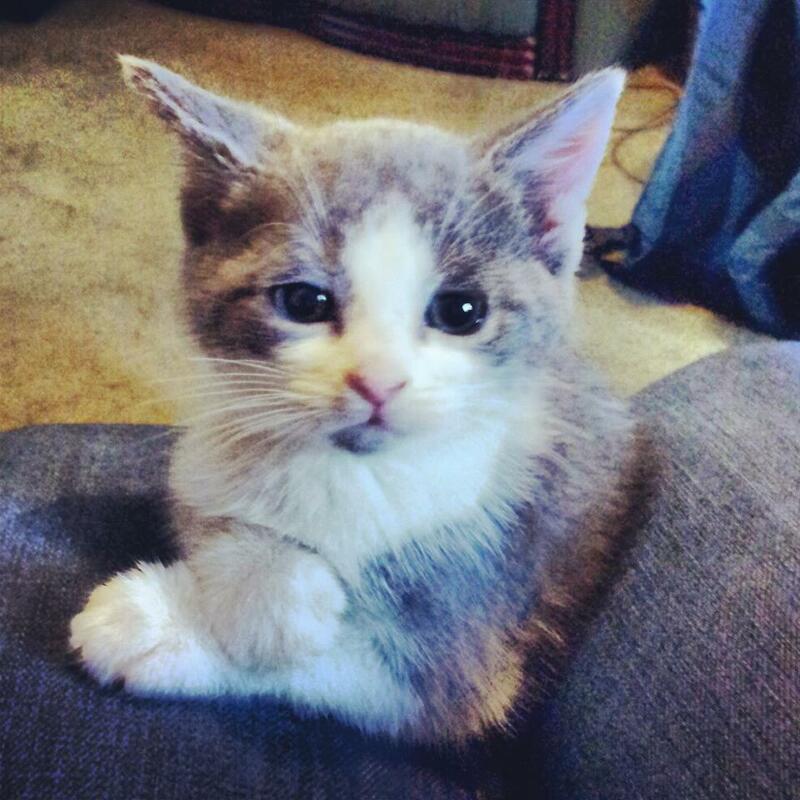 He’s a grey and white kitten born February 2013. Pictures taken 29 April 2013 14:54:51. My parents have always been interested in raising livestock since Hugh Fearnly Whittingstool’s River Cottage project was aired on Channel 4. This combined with Jamie Oliver’s battery chicken campaign made my parents want chickens all the more. We lived in a busy town on the outskirts of London, and had always planned on doing this when we move (which finally happened in February 2016). My parents intend to move once my Dad retires in 2013. However, a family friend living on the Isle of Wight convinced my Dad that it was completely achievable in an urban setting. 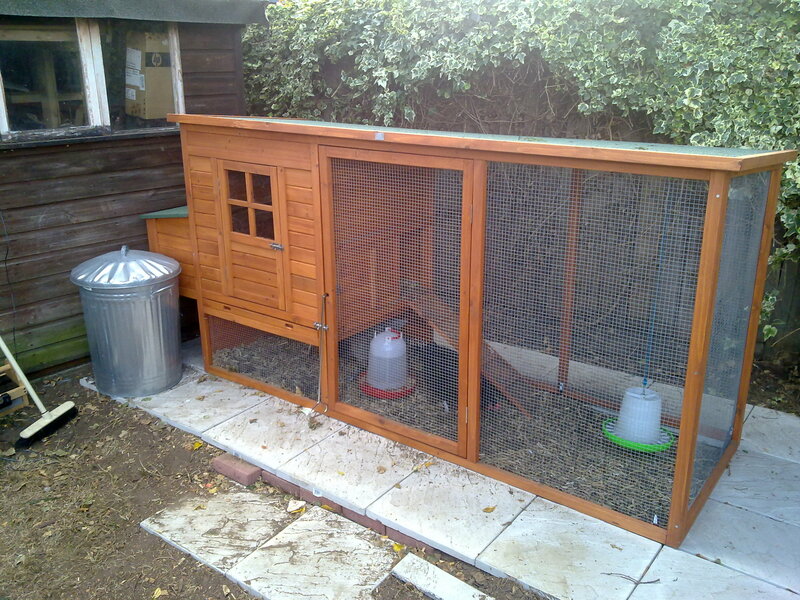 We ordered the chicken coop made by ComfyPets from eBay UK. The chickens came from Smilers Farm Poultry, a farm about an hours drive away from us. We bought 4 birds, with the intention of buying 2 more at a later stage. We had no idea how hard it would be to keep chickens. Our primary concern was that the foxes would get into the coop. The paving slabs around the coop serve a double purpose. They provide a nice path to stand on, and also prevent the foxes from digging into the cage. We bought a galvanised dustbin (shown left) to keep the food (Layers Pellets, Mixed Corn, Mealworm, etc) inside, in an attempt to keep out vermin. Soon after putting the chickens into the coop it was evident that there wasn’t as much room as we would have liked. We decided to extend the back of the coop to just over double the size. This was done by just doubling the side pieces while ensuring the slope for the roof. We used welded steal wire for the sides as it is slightly more heavy duty than traditional chicken wire. The wire mesh was stabled to the wooden frame with large staples. The above photo of the extended chicken coop was taken 9 months after the original installation of the coop, though it was extended much earlier. The two hanging containers contain food (green, right) and water (red, left) and are kept topped up. The side dishes (white, under the house, on the back and side walls) contain grit, water and food. 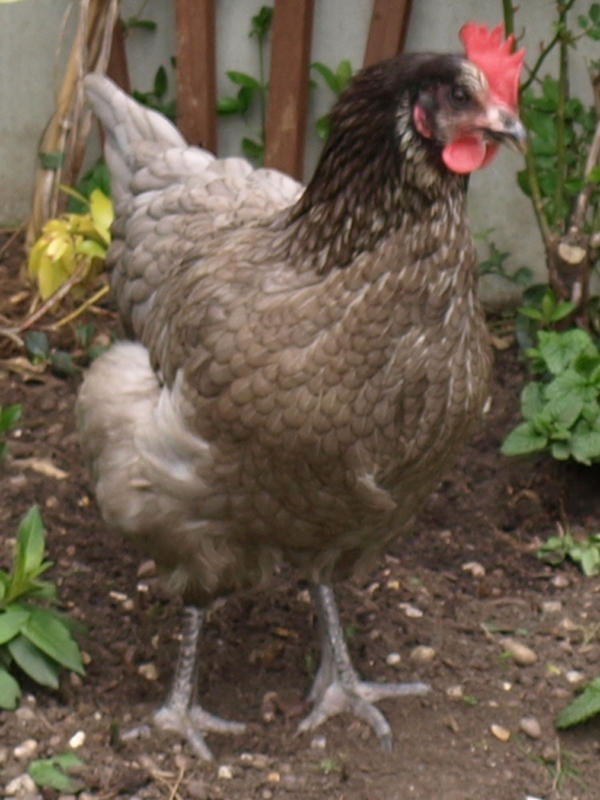 In the early stages, the bossy chicken (named Queenie) stopped the smaller (Tikka and Nuggets) from eating/drinking – hence the reason for doubling up the food and water. We allow the chickens to roam the garden during the daytime, when we are about. The family dog (Bob, above) behaves perfectly with the chickens whom really aren’t bothered by the dog at all. We had originally planned to ‘rescue’ 4 chickens from battery farms. However, this was not possible because at the time we finished the coop it was just before Christmas. 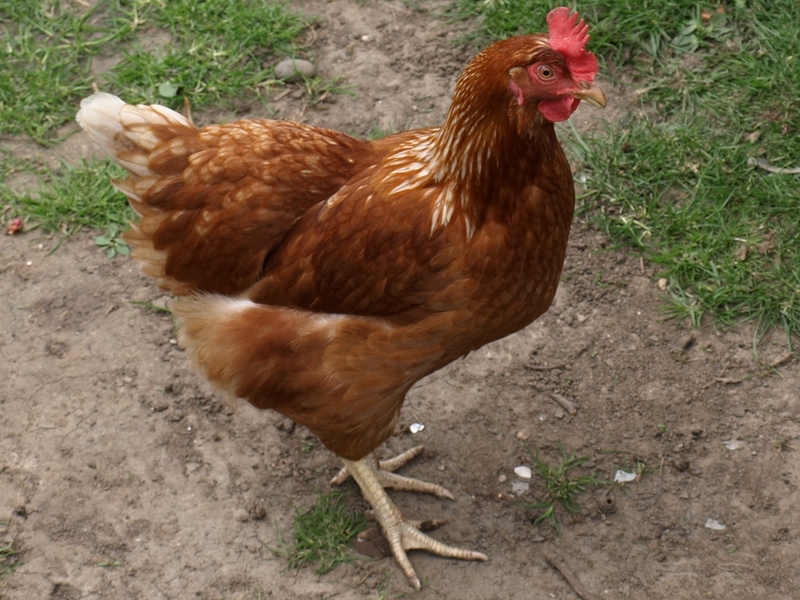 For obvious reasons, battery farm chickens are not issued to the public before Christmas. After Christmas, there was a large waiting list ex-battery hens. 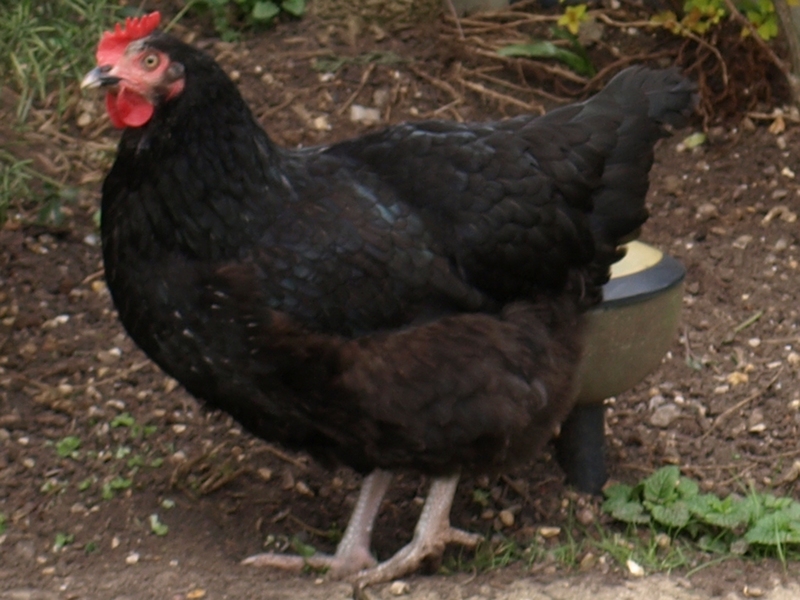 For this reason we decided to buy the chickens, with the intention of getting some ex-battery hens once we had things settled – We still haven’t got to this point yet, as we are in the process of making a fence to stop the hens from entering the main garden. Our garden is split into 2 sections; an upper part with the shed, chicken coop and vegetable plots; and a lower part with flowers, tables and chairs, and otherwise the part we use frequently. When the chickens wander down into the lower part, they eat all of the buds off of the flowers and generally cause havoc.